Only a small handful of players in Major League Baseball history have amassed 500 or more home runs and 3,000 hits. 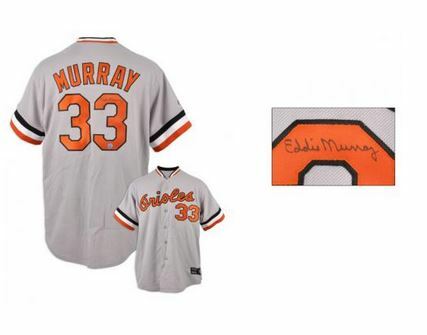 Eddie Murray is one them. 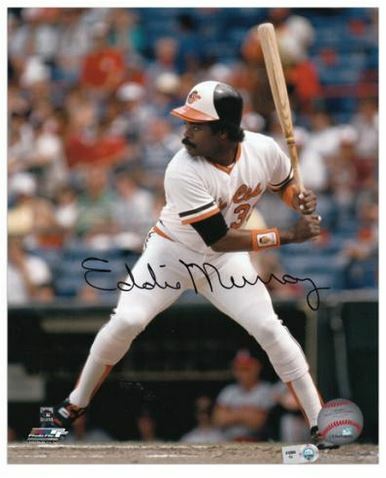 As a result, Eddie Murray cards and autographed memorabilia have a captive collecting base, even if prices are a little softer than other players from his era. Inducted into the Hall of Fame in 2003, it gave Murray's career a nice bookend to pair with his Rookie of the Year Award in 1977. The eight-time All-Star put together an impressive resume during his illustrious career that included a World Series Championship. 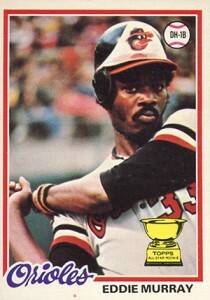 Eddie Murray has two rookie cards that are found in 1978 O-Pee-Chee and 1978 Topps Baseball. High-grade examples of each card can be very difficult to find with very few receiving 10s to date. 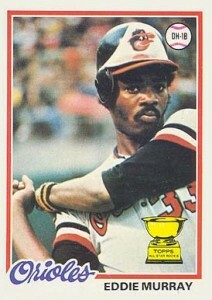 As a result, Eddie Murray's rookie cards command a sizable premium in such condition. In addition to his rookie cards, Murray has two food issues that are also popular, 1978 Hostess and 1978 Kellogg's. The Kellogg's release, in particular, is highly collectible because unlike some food issues of the era, these cards are fully licensed showing Murray in full uniform complete with team logos and colors. Murray's first certified autograph cards can be found in 1997 SPx and 1997 Donruss Signature Series. In 1999, Upper Deck produced Murray's first memorabilia cards as part of their Piece of History and Century Legends sets. He has both a bat card, as part of the 500 Home Run Club subset, which is limited to 350 copies and a jersey card as part of the Jerseys of the Century subset. 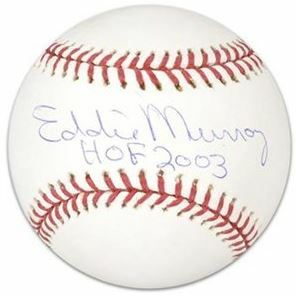 Eddie Murray's autographed memorabilia remains in strong demand despite being a fairly regular signer at sports collectibles conventions around the country. Single- and multi-signed baseballs and bats are among common items he is asked to sign as collectors add him to their respective club collections for both 3,000 Hits and 500 Home Runs. There's not much that separates the O-Pee-Chee Eddie Murray rookie card from its Topps counterpart other than the bilingual text on the back. It's also tougher to find. In typical O-Pee-Chee fashion, edges and centering are major issues when it comes to condition. The design of the 1978 Topps Baseball set is a classic due to its simplicity. Collectors are fortunate that Murray doesn't share his rookie card with any other players. The card has the added benefit of the Topps All-Star Rookie trophy. Below you will find an example of what Eddie Murray's authentic signature looks like. This can be used as a first point of reference for determining the legitimacy of autograph memorabilia, but is not a substitute for having your items authenticated by a well-respected professional autograph authentication company. Some of the trusted sources within the sports memorabilia market include the following companies: PSA, JSA, Steiner, Mounted Memories and Tristar. Click on any of the images below to view full size photos. A very easy to read and legible signature in standard cursive. The "letters "E" and "M" are over-sized. The "E" looks like a backwards "3" with each line equal in length. Fully closed loops are present on the letters "d."
The "i" is dotted and the "e" sometimes is open depending on the writing instrument used. The "M" has rounded humps and vertical lines equal in length. The "a" is closed and the "y" has a small tail that forms a loop.